Original Editors - Erin Shinkle from Bellarmine University's Pathophysiology of Complex Patient Problems project. Goiter, Exophthalmos, tremors, dermopaty, tachycardia with palpitations, heat intolerances, weight loss, increased deep tendon reflexes, weakness and muscle atrophy, increased cardiac output, myasthenia gravis, thin hair, warm moist skin, sensitivity to light, dysphasia, diarrhea, amenorrhea, polyuria, and many other presentations, some of which may not be as common and more subtle. 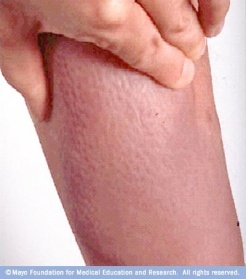 Rhuematoid arthritis is one of the major associated autoimmune diseases along with Systematic lupus. There is an overall raise in incidence for a co-morbidity of any autoimmune diseases. Recommendation for futher autoimmune disease screening may be warrented with the diagnosis of Graves' disease. There is also an increased risk of cancer in the thyroid nodules associated with Graves' disease and further ultrasonography imaging and/or biopsy may be needed for further testing if suspected malignancy. Antithyroid drugs have the main effect of inhibition of thyroid hormones as well as a secondary purpose of reduction of thyrotropin-receptor antibodies and increasing supressor T-cells. These drugs are used mainly for controlling the thyroid in hopes to create euthyroid and have a remission period rom Graves' Disease. The three main medications are Methimazole, Carbimazole, and Propylthiouracil. The most perferred medication is methimazole, however, there are no significant differences among the antithyroid drugs in their success rates. Beta Adrenergic- Antagonist Drugs is used for treatment of symptoms such as tremors, anxiety, and palpitations. This medication is used as an adjunct therapy to other means of management for Graves disease. Inorganic Iodide is used only for short term reduction of thyroid hormones lasting effects from days to a few weeks. Radioiodine Therapy is becoming a more popular means of treatment which is used to destroy thyroid tissue with the ultimate goal of balanced thyroid hormones or hypothyriodism. Thyroid blood serum tests are taken. A positive test result s in a decreased or normal TSH levels, elevated free thyroxine T4 for a diagnosis of hyperthyriodism. To specify graves disease Radioiodine uptake test is used. Thyroid stimulating Hormone Antibodies (TRAb) and thyroid peroxidase autoantibodies (TPOAb) may be found in most patients, but is not needed for specific diagnosis since most patients are diagnosed with blood serum tests and symptomology. Graves' Diseaase has both genetic causes, such as a lack of suppressor t-cells causing increase in TSH receptor antibodies, and environmental causes which includes, but not limited to: stress, smoking, post pardum, and infections. 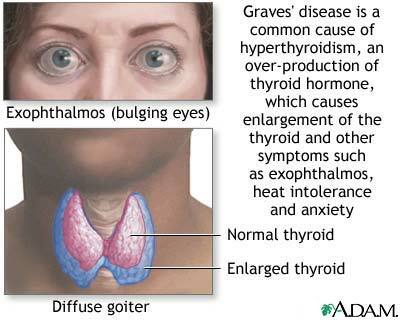 Graves' Disease is a systemic autoimmune disease that effect the eyes (as seen above with Exophthalmos), skin, and thyroid gland (which regulates the body on multiple levels). The current best management of Graves' disease varies upon several factors of the individual recieving it. The options include partial/full removal of the thyroid gland, antithyroid drug therapy, and radioiodine therapy. There are adjunct treatments for symptom management until euthyroid is acheived through medical management. Current clinical practice suggests that radioiodine therapy is the primary choice of treatment for Graves' disease, then either antithyriod drugs or surgery depending on the contraindications for one or the other. Graves' disease is not directly managed by physical therapy but percautions and understanding of the disease is necessary when working with these patients. Deconditioning and muscle weakness are secondary ailments that is seen in this population and can be managed by a physical therapist. 4E: impaired joint mobility, motor function, muscle performance, and range of motion associated with localized inflammation. Hyperthyroidism has key elements that will cause a decreased tolerance to physical activity. Therapists should be sensitive to patient complaints and symptoms to note an exacerbation if patient is already diagnosed or be able to recognize symptoms in order to refer to physician. Medications can fluxuate the thyroid hormones to either send patient into Hypothyroidism or Hyperthyroidism. It is imparative to watch for symptoms or patient complaints that may indicate a fluxuation and refer patient back to their endocrinologist since these two extremes will vary tolerance for physical activity. If patient has recently had surgery or radioiodine treatment it is possible that you will see hypothyroidism. If patient is on Beta blockers for management tremors, anxiety, and palpitations during exacerbation period, the therapist must be aware fo the physiological effects this can have on a patient during physical therapy.Therefore, a better measurement of vitals is rate of percieved exertion. ↑ 1.0 1.1 1.2 1.3 1.4 1.5 Ginsberg J. Diagnosis and Management of Graves’ Disease. Canadian Medical Associates Journal. 2003; 168(5):575-85. ↑ 2.0 2.1 2.2 2.3 2.4 2.5 2.6 2.7 Goodman C, Snyder T. Differential Diagnosis for Physical Therapists: Screening for Referral. St. Louis, Missouri: Saunders Elsevier, 2007. ↑ 3.0 3.1 Hemminki K, Li X, Sundquist J, Sundquist K. The epidemiology of Graves’ disease: Evidence of a genetic and an environmental contribution. Journal of Autoimmunity 2010; 34:307-13. ↑ 4.00 4.01 4.02 4.03 4.04 4.05 4.06 4.07 4.08 4.09 4.10 Goodman C, Fuller K. Pathology: Implications for the Physical Therapist. St. Louis, Missouri: Saunders Elsevier; 2009. ↑ Boelaert K, Newby PR, Simmonds MJ, Holder RL, et al.Prevalence and relative risk of other autommune diseases in subjects with autoimmune thyroid disorders. American Journal of Medicine. 2010 Feb;123(2):183. ↑ 7.0 7.1 7.2 7.3 Franklyn J. The management of Hyperthyroidism. New England Journal of Medicine. 1994; 331(8):559. ↑ 8.0 8.1 8.2 8.3 Cooper D. Antithyroid drugs in the management of patients with Graves’ disease: An evidence based approach to therapeutic controversies. Journal of Clinical Endocrine and Metabolism. 2003; 88:3474-81. ↑ 9.0 9.1 Fukushima H, Matsuo H, Imamura K, et al. Diagnosis and discrimination of autoimmune graves’ diseas nad Hashimoto’s disease using thyroid stimulation hormone receptor-containing recombinant proteoliposomes. Journal of Bioscience and Bioengineering. 2009. 108(6):551-56. ↑ Koyuncu A, AYdin C, Topcu O, et Al. Could thyroidectomy become the stansard treatment for Graves’ Disease? Surgery Today. 2010. 40:22-25. ↑ Panareo S, Rossi R, Fabbri S, et al. A practical method for the estimation of therapeutic activity in the treatment of Graves’ Disease hyperthyroidism. J of Nucl Med Mol Imaging. 2010. 54:1-9. ↑ Mercuro G, Panzuto MG, Bina A, et al. Cardiac function, physical exercise Capacity, and quality of Life during long term thyrotropin-suppressive therapy with Levothyroxine: Effect of individual Dose Tailoring. J of Clinical endocrinology and metabolism. 2000 85: 159-164.